Blepharoplasty (or eyelid surgery) is the procedure that modifies the aging appearance of the eyelids. It may be performed on both the upper and lower eyelids to remove excess skin and protruding fat. Upper lid Blepharoplasty surgery will remove the excess fat and wrinkled, drooping skin of the upper eyelids that can make you look tired or sad. Fat and skin are removed from an incision placed through a well-hidden incision in the upper lid crease, which is a natural fold in the skin. Lower lid Blepharoplasty surgery will eliminate the bags under your eyes and tighten the skin to give a more rested, youthful appearance. The lower eyelid requires an incision below your lashes or in many cases, an incision is placed on the underneath side of the lid, which is not visible at all. A “Pinch Blepharoplasty” is a minimally invasive technique where only the excess skin is addressed. Because the incisions are made in natural skin folds of the eyelids or on the undersurface of the eyelids, they are effectively unnoticeable after healing. Sutures are generally removed within 5-7 days. Healing time is minimized by a careful surgical technique which, in many cases, can be performed in the office or as an outpatient procedure at Northwestern Memorial Hospital. Slight bruising will typically resolve in less than 1 week. What you can expect after surgery? Dr. Sidle believes in a conservative approach to blepharoplasty. By avoiding the excessive removal of tissue, he is able to decrease the risk of complications or an unnatural “wide-eyed” or hollowed appearance after surgery. As with all of his surgical procedures, Dr. Sidle strives for natural appearing improvement. 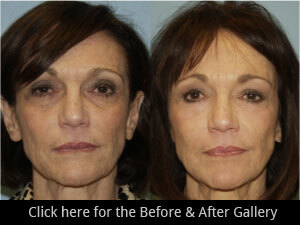 Blepharoplasty can be a nice adjunct to facelift surgery or a brow lift surgery to rejuvenate the aging face.